The Comfort Inn & Suites® hotel in Fort Smith, Arkansas is conveniently located off Interstate 540 and Rogers Avenue with easy access to the Fort Smith Trolley Museum, Fort Chaffee and A&M Scenic Railway. This Fort Smith, AR hotel is close to Central Mall, Fort Smith Pavilion and several restaurants and shops. Guests at the Comfort Inn & Suites will enjoy on-site features like the seasonal outdoor pool and sundeck, exercise room, picnic area and interior corridors that offer easy and safe room access. Its perfect location and convenient access to area attractions make the Comfort Inn & Suites® hotel a great place for business and leisure travelers in the Fort Smith, Arkansas area. Book a room with us today; we look forward to your stay. •	Complimentary full hot breakfast, including egg and protein options, delicious oatmeal, fresh baked waffles, as well as healthy choices such as a variety of cereals, yogurt, fruit and more. •	Free, high-speed internet access. •	Clean and fresh platform beds with Sealy ® mattresses with triple sheeting. Thanks to our friends at TempleLive in Ft.Smith we have a few tickets to see Red Sun Rising this Wednesday April 10th so we thought we would give some away!! We have 10 tickets so we will pick 5 winners. We will start to pick winners on Thursday at 12pm!! From all of us at Comfort Inn & Suites and G & G Hospitality!! Can’t wait to serve you inside or through our drive through! Offering a healthy-sized by-the-slice option or the whole pie....because you’ll want more 😉 @ Chaffee Pizza Co.
A big Thank You to all Law Enforcement. Especially Fort Smith Police Department for always making sure the city and businesses are safe. HOTEL ROOKIE OF THE YEAR FAIRFIELD INN & SUITES BY MARRIOTT FORT SMITH!!!! G&G Hospitality would like to take a moment to thank our associates, partners, friends and family in achieving the 2018 Rookie of The Year recognition by Marriott International. This could not be possible without the core values instilled by our parents and embraced by our company’s way of doing business. Once Again Thank you friends and family for your love, support and confidence in us and the company. Only 13 more days til Christmas! Don’t forget what really matters during this time. We hope that you will get to spend this Christmas season with the ones you love. The entire staff at Comfort Inn & Suites would like to say Thank You to all that has served and to those who are serving now. We greatly appreciate your sacrifice. "Scott Clark, developer of the Gusano’s building., said Thursday he anticipates an opening for Gusano's Chicago-Style Pizzeria-Fort Smith and Uncork'd by the end of October and Baskin Robbins-Fort Smith by next week... Uncork’d to offer wine and a tapas menu, along with 40 taps to dispense a variety of regional craft beer." Sara Evans just confirmed the booking for a FREE show in Lee Creek Tavern! Introducing the STAR TOWER! You'll be hoisted 90 feet in the air for a breathtaking tour of the midway in this brand new ride. Manufactured in Europe earlier this year, this ride is a must for thrill-seekers and casual riders alike. Thousands of color-shifting LEDs combine to create mesmerizing, ever-changing light displays that tower above the fairgrounds. What an absolute honor it was to be the host hotel the Dan Burton FCA Outdoor Expo. It was a privilege to meet Tim Guraedy AKA Mountain Man from A&E’s hit show Duck Dynasty. ONLY 1 DAY LEFT before Jase Robertson joins us to talk about his faith and the great outdoors at the FREE ADMISSION FCA OUTDOOR EXPO, Sept. 15 at Kay Rodgers Park. Jase will take the stage with JIMMY HOUSTON around 6:30pm. But be sure to join us between 9am-6pm for a full day of family-fun activities at the Expo. Check out the whole schedule of events at FCAOutdoorExpo.com. Don't keep this event to yourself--be sure to tell your friends and family. We can't wait to see tomorrow! The FREE ADMISSION FCA Outdoor Expo is this Saturday from 9am-6pm at Kay Rodgers Park! With over 100 outdoor vendors, fun activities for the family, live music, and over $75,000 in raffle prizes, we wanted to make sure you didn't miss out on some of our great speakers! Friday night, Sept. 14, join Gov. Asa Hutchinson and Kingdom Dog Ministries at 6:30pm for a special VIP dinner. Tickets are just $25, include dinner, and are still available by clicking below. Saturday night, Sept. 15 at 6:30pm, Jase Robertson will be sharing his story with us, along with JIMMY HOUSTON. Again, it's FREE ADMISSION, with $10 VIP parking. We're so excited to have these speakers share about how the gospel has influenced their lives. Join us this Friday night and Saturday, and please invite your friends! We want as many people as possible to hear the gospel through this event! Comfort Inn & Suites is hiring energetic people to join our housekeeping department. If interested please go to www.gghhospitalitygroup.com and fill out an application. Or call 479.434.5400 to set up an interview. World Cutting Horse Association, LLC. Wishing our Executive Housekeeper Brenda a very Happy Birthday!! Our guests have spoken!!! 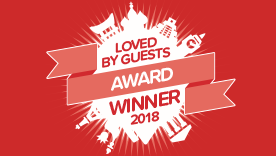 We are a #lovedbyguests award winner. We cant say Thank You enough. Book a night. Stay a night. Repeat. And earn a future free night to stay at a Comfort hotel or one of our other 10 brands. Don't let anything get in your way. Book direct at ChoiceHotels.com and get the lowest price, guaranteed, always. Its Rodeo Time! Dont forget to make your reservations for the Battle Of The Bad Rodeo presented by 7 C's. We are offering special discounted rates for this event. Call us directly at 479.434.5400. Comfort Inn & Suites would like to congratulate Samuel Sykes as our new Front Desk Manager. We get it, a #FamilyRoadTrip isn’t always a walk in the park. But the memories you’ll make once you reach your destination are worth getting lost a time or two. Leave a comment below and tell us your best #FamilyRoadTrip story- the good- the bad, and the funny. We may feature yours in an upcoming article. [12/03/17] Comfort Inn & Suites in Fort Smith has made some very nice changes!! NEW CARPET AND NEW DECOR! Come be a part of a very nice experience at the Comfort Inn & Suites in Fort Smith! Happy pumpkin carving and #HappyHalloween! We’re getting ready to reveal the grand opening date of our SnowFlex Park! But before we do, we want to give away 4 TICKETS🎟 to the GRAND OPENING of the SnowFlex and 4 T-Shirts! !👕 LIKE + SHARE this post and TAG 3 friends you’d like ride the new SnowFlex Park with! Winner will be announced next Wednesday!